« CES Is On: Hope the Hype Hits! 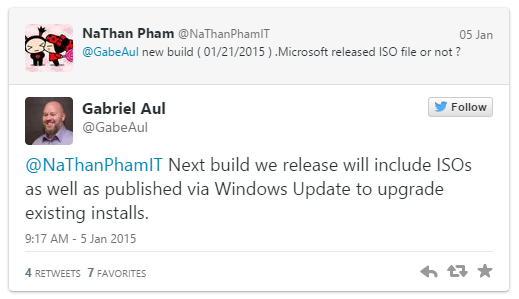 Visual evidence that ISOs will be available from the get-go for the “Customer Preview” analog for Win10. This is a welcome departure from previous practice, and will make it much easier for those jumping into Windows 10 for the first time, especially if they plan to install on multiple test rigs at the same time. The timing of the upcoming release is still in the air, though many interested observers assume it will happen on January 21, the same day that Microsoft has set aside for its next public Windows 10 event, or shortly thereafter (as was the case with the initial Technical Preview event last September). Glad you think so. I wish MS had been doing this since day one.